You want to have all of your podcasts (not just some…) online for people to listen to, to learn about you and whatever your focus is. You want to be the next super-popular, server-breaking podcast talent. The problem is, especially for you podcasters with larger libraries – you can’t afford to have your entire libraries online to achieve the success you want – until now. We’ve been hosting podcasts since 2005. The numbers say you’re not going to be one of the super-popular, server-breaking podcast talents in our industry. The bottom line is to even be in the same atmosphere of “the greats” you need to have a solid, viable, vibrant library that won’t break the bank to have it online. 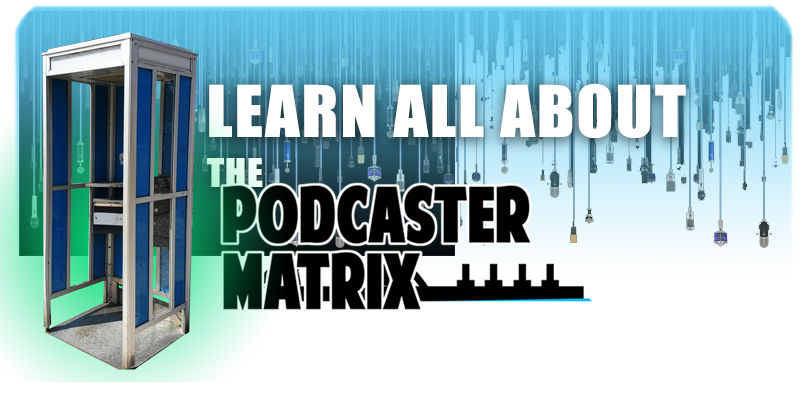 The Podcaster Matrix is your center-point for “real world” entire podcast library hosting – and a whole lot more. Read on below to understand more about our roots (from now 13 years ago), the customers we’ve helped to spawn grand, monetized, engaging and educational podcast programs, and visit back regularly to see who has chosen to take The Podcaster Matrix Pill. It’s time to remove yourself from “Expensive Podcast Hosting Wonderland” and experience the “real world” of entire Podcast Library Hosting with The Podcaster Matrix. The seeds of podcasting experiences started with a little show called “The 24 Podcast” which detailed the adventures Jack Bauer inside the hit Fox show, “24” starring Keifer Sutherland. What was a geek and community, became an online program that embrace the realm of podcasting and ignited the graphic that pushed and continues to push an entire network of podcasts. As time, the industry and the discovery of podcasting took root, more clients, storytellers, professions with experience and those with interesting perspectives chose to share their legacy. Podcasting is an unmatched platform for captured experience. Whether you’re just a dude with a passion for a television show, or someone who wants to use the medium to seek out, corral and sell to audiences around the world, or anyone in-between, podcasting allows you to do it all. The growing team of OG Podcasters, Editors, Promotional Specialist and more are eager to help you achieve the successes you’ve only dreamed of, but a real, attainable goals. Our niche skill sets and experiences will help you find the “real world” of entire podcast media library hosting, a promotional model to grow your audiences, as well as remembering to layer in FUN to keep it all fresh and exciting. Be sure to check out our complete services listing now to learn how The Podcaster Matrix, our partner companies and perspectives can help you change the way you generate podcasting. It’s all about having the time you want to spend the way you want to and we specialize in taking detailed tasks off your plate, and making them a piece of the finely crafted machine that should be EVERY podcast experience. We can’t wait to help YOU make YOURS.